The Division had now been continuously in the line 122 days. Its infantry strength was reduced so that many companies had only 70-80 combat efectives, On December 13 the Sixth Army Group decided to relieve it, but, with no reserve division available, a switch of positions with the 3rd Division was arranged. The 3rd had been garrisoning Strasbourg and patrolling the Rhine for two weeks, a relatively easy task. Though not a relief from contact with the enemy, it at least meant a quiet sector. The task of shifting two divisions, both in contact with the enemy, one of them actively, posed a difficult problem, one probably never before attempted in the history of warfare. Only one or two battalions could be switched at a time, for the 3rd could not shorten its front either. Some 35 miles separated the two divisions. At a conference between Brigadier General Robert Young, commanding the 3rd Division, General Montsabert, commanding 11 French Corps, and General Dahlquist, it was decided to bring the 30th RCT, then in 3rd Division reserve, down from Strasbourg first, and to use it to attack on the left of the 36th to capture Kaysersberg and close the gap between the 36th and the French forces. This would not relieve any 36th Division troops but it would give the 3rd Division a much better position. Kaysersberg having been captured, relief of the 36th would start, one or two battalions at a time. Its masterful Gothic form tarnished by the pock-marks of several wars, the Strasbourg Cathedral still stands as one of the world's most beautiful examples of ecclesiastical architecture. Most famous object of a less-interesting interior is the astronomical clock. Moving discs on the clock show the day of the month, eclipses of the sun and the course of the planets. 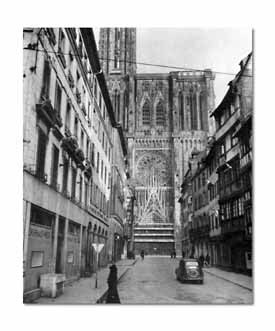 In 1870 the Germans used the cathedral"s towering spire as an artillery registration point when they shelled the city. From the top of the platform it is possible to look out over the Black Forest, Rhine River, and the Vosges mountains. The 30th arrived on December 14 and attacked from the vicinity of Aubure at noon on the following day. Gaining surprise, Kaysersberg and the hill south of it were captured on the 16th. That night the 1st Battalion, 141st, started for Strasbourg. Early on the 17th the Germans struck back furiously at the 30th Infantry, retook the bill south of Kaysersberg and a part of the town. By noon a critical situation had arisen. The 2nd Battalion, 141st, and a detachment of the 5th Combat Command of the 4th French Armored Division, which had that morning arrived in Riquewihr, attacked Kientzheirn in an effort to turn the German flank. This attack, made without preparation, was a great success. Kientzheirn was captured but darkness halted further progress. At daylight the next morning Company G and the French tanks moved against Kaysersberg and succeeded in bottling up the Germans fighting the 30th Infantry. The city was again taken and the hill south of it recaptured by the 30th Infantry. Late at night the French armor and the 2nd Battalion, 141st, moved into Ammerschwihr. On December 19, the 141st, less the 2nd Battalion, motored to Strasbourg and the 2nd Battalion, 15th Infantry, arrived in the Colmar sector. An attempt to take Sigolsheim by the 3rd Battalion, 143rd, the 2nd Battalion, 15th Infantry, and French armor failed but a solid line from the hill south of Kaysersberg to Selestat had been established. On December 20 the remainder of the 15th Infantry arrived and the 143rd started for Strasbourg. On the 21st the 3rd Division took command of the Colmar sector and the 36th the Strasbourg sector. Next day the 142nd moved up and the relief was completed. For the first time since August 15 the Division was not in direct contact with the enemy. Now the Rhine River separated it from the Germans. In the battle just concluded on the outskirts of Colmar the Division had come through its greatest crisis with flying colors. A serious attempt to separate the First French Army from the Seventh Army had been frustrated and a stinging defeat administered to the Germans. Since August 15 the Division had been in the line continuously. It had made its second landing on a defended beach, defeated the Nineteenth German Army at Montelimar, crossed the Moselle, fought over the high Vosges barrier, and finally prevented an enemy breakthrough just before the Von Rundstedt offensive in the Ardennes began. On December 25, when the Division retired from the Strasbourg sector and officially closed its lengthy stay in the line at 133 days, 19,751 prisoners had passed through its cages since the Riviera landings, and a greater number of the enemy had been killed and wounded. 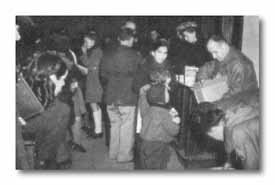 On Christmas Day, 1944, members of the Division gave a party for the children of the city.